For several decades the writings of sociologist Neil J. Smelser have won him a vast and admiring audience across several disciplines. Best known for his work on social movements, economic sociology, and British social history, Smelser's psychoanalytic writings are less familiar to his readers. In fact, many people are completely unaware of Smelser's formal psychoanalytic training and ongoing counseling practice. 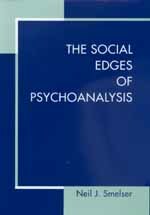 With the publication of The Social Edges of Psychoanalysis, Smelser's thought-provoking essays on psychoanalytic concepts are finally brought together in one book. Psychoanalytic theory has had an ambivalent relationship with sociology, and these essays explore that ambivalence, providing arguments about how and why psychoanalytic approaches can deepen the sociological perspective. One of Smelser's main tenets is that human social behavior always contains both social-structural and social-psychological elements, and that psychoanalytic theory can bridge these two dimensions of human social life. Many of the issues Smelser addresses—including interdisciplinarity, the macro-micro link in research, masculinity and violence, and affirmative action—have generated considerable scholarly interest. This collection paves the way for further articulation of the relationship between sociology and psychoanalysis at a time when many sociologists are looking for interdisciplinary links in their work. Presented with clarity and grace, and free of the murkiness often found in both sociological and psychoanalytic writing, Smelser's new book will excite reflection and research on the less visible dynamics of social existence. Neil J. Smelser is Director of the Center for Advanced Study in the Behavioral Sciences in Stanford, California, and University Professor Emeritus of Sociology at the University of California, Berkeley. His many books include Problematics of Sociology: The Georg Simmel Lectures, 1995 (California, 1997).